Ben Carson has been confirmed as secretary of the U.S. Department of Housing and Urban Development (HUD) to the weak congratulations of housing organizations that didn’t want to waste their political capital fighting a done deal and did want to make the case for their concerns on the off chance that something might get through. But the lay of the land looks different now than it did when Carson was first nominated and vetted by the Senate. At the time, many observers tried to put a silver lining on Carson’s total lack of relevant experience by noting that the assistant secretaries could make a huge difference. “Regardless of the chosen secretary of HUD, there will be much less to fear if assistant secretaries come with credentials like [Pam] Patenaude’s. Cameras may focus on hearings for secretary nominees, but all of us should focus on the next tier in each federal agency,” wrote Martin French in a comment on my first post about the HUD secretary nominations. Pam Patenaude of the Terwilliger Foundation for Housing America's Families (which may explain why, after Patenaude was passed over for the top job, the Center issued such an insufferably gushy statement about the choice of Carson). Rick Lazio, a former Republican congressman who served as the deputy majority whip, assistant majority leader, and chair of the House Subcommittee on Housing and Community Opportunity, who was considered a moderate in his party. Though he once advocated for the repeal of the 1937 Housing Act, his positions on HUD funding in this 1997 Shelterforce interview look far more reasonable in today's context than they did at the time (don't tell 1997 that). He has also become more of an affordable housing advocate over time, leading the national housing finance practice group of Jones Walker LLP, and sitting on the board of the Terwilliger Foundation and Enterprise Community Partners. Brian Montgomery, who served as acting HUD secretary and assistant secretary for housing in the Obama administration, as well as numerous other extremely relevant government roles and on the board of NeighborWorks. One has to wonder if his inclusion on this list is a red herring (would this administration really accept someone with so much experience under President Obama?) and also why he would want to serve in this administration even if asked. Again, that was the purported list as of Dec. 7, 2016. If that date seems like a long time ago, well, that’s because it is. 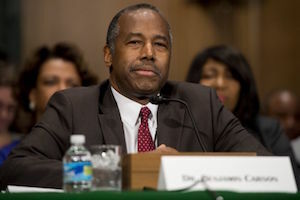 As of today, no nomination has yet been made for deputy secretary (Ron Sims was nominated as deputy secretary of HUD by President Obama on Feb. 2, 2009) or any of HUD’s assistant secretary positions. In fact, as far as 2nd-tier leadership goes, the administration has so far nominated only two deputy secretaries plus a deputy attorney general and two associate attorneys general across the whole federal government. Cheerful. Unless, of course, the people who would end up filling those roles would not be from the list above, but instead cast in the mold of the cabinet-level appointees—picked expressly for their antipathy for that which they are supposed to be overseeing. In which case limbo might be preferable. By the time HUD has a deputy secretary, crucial conversations about topics such as Dodd-Frank and fair housing enforcement and data collection will be well underway—not to mention broader questions about what kind of nation we want to be. We would do well to not wait to see who, if anyone, fills those leadership roles before joining those conversations ourselves.